3-4 West Pallant is a magnificent Grade II listed Georgian townhouse which in recent years has undergone an extensive refurbishment programme, creating a truly outstanding home of exceptional quality and style. The accommodation is arranged over three floors with a cellar below. The ground floor has an entrance hall with a tiled flooring and doors to all the principal rooms, a cloakroom and the rear garden. Staircases lead to the first floor and the basement, which provides excellent storage and a former solicitors safe room. The elegantly proportioned living room enjoys high ceilings, complete with feature fireplace and sash windows with folding shutters. The dining room also has a character fireplace and sash window to the front. The kitchen breakfast room has sash windows with bench seats and views of the rear gardens. The kitchen is fitted with a contemporary design units with wooden worktops and integral appliances. The first floor provides a stunning master bedroom suite, with floor to ceiling sash windows, feature fireplace and a walk-in dressing area that leads through to an wonderful en-suite bathroom with separate walk-in shower. The second bedroom has the use of the bathroom. To the second floor are two further bedrooms which share a bathroom. 3-4 West Pallant is Situated in the heart of the historic City of Chichester which provides a wide variety of cultural, leisure and shopping facilities. 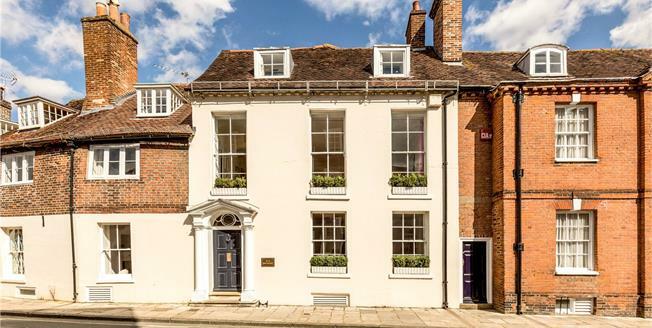 These include the renowned Festival Theatre, Historic Cathedral, Summer Arts Festival, Pallant House Gallery and museums as well as a wide variety of bars and restaurants. To the south of Chichester there are the charming waterside villages of Bosham and Itchenor together with Sidlesham which borders the Pagham Harbour Nature Reserve. The Solent and many nearby sailing clubs and marinas provide exceptional facilities for boating and sailing enthusiast of all abilities. West Wittering and the National Trust Reserve of East Head offer spectacular scenery, sweeping beaches and a broad choice of recreational and water related sporting facilities. To the north of Chichester is the South Downs National Park which provides miles of beautiful walks and rides. At Goodwood there is the famous race course, golf courses and airfield and which is also home to the annual Festival of Speed and The Revival. From Chichester there is a main line rail service to London Victoria (approximately 90 minutes) and the A27 provides access to Brighton to the east and Southampton to the west. The walled garden is a unique feature of the property that offers westerly views of Chichester Cathedral. Mainly laid to lawn and bordered by an array of mature shrubs and trees, the garden offers a significant degree of peace and seclusion. There is also a charming terrace area for entertaining.